The plant endomembrane system is comprised of the endoplasmic reticulum (ER), the Golgi complex, trans-Golgi network (TGN), pre-vacuolar compartment (PVC) and vacuoles. The endomembrane system, by enabling protein modification and sorting, plays important roles in cell polarity, cytokinesis, cell wall formation, signaling, and stress tolerance. Maintaining a specific luminal pH is critical for the operation of the endomembrane system. Studies have shown that the lumen of the endomembrane system becomes more acidic during progression through the secretory or endocytotic pathways in both plant and animal cells. Homeostatic pH conditions are maintained by the concerted activity of both H+-pumps and ion/H+ cotransporters. One such type of cotransporter, the K+ efflux antiporter (KEA) proteins of plants, are phylogenetically related to the K+ efflux transporters EcKefB and EcKefC of Escherichia coli. The KEA gene family is a subgroup of the large Cation Proton Antiporter 2 (CPA2) family of cation/proton antiporters of Arabidopsis. Based on molecular phylogenetic considerations, the KEA clade is subdivided into two subgroups: KEA1-3 and KEA4-6. Although it has been determined that the KEA1-3 group functions in chloroplast physiology, the subcellular localization and physiological role of KEA4, KEA5, and KEA6 remain unknown. Zhu et al. (10.1104/pp.18.01053) report concerning the gene expression pattern, subcellular localization, and physiological function of KEA4-6 in Arabidopsis. KEA4, KEA5, and KEA6 have a similar tissue expression pattern and the three KEA proteins localized to the Golgi, the trans-Golgi network (TGN), and the pre-vacuolar compartment (PVC), suggesting overlapping roles of these proteins in the endomembrane system. Phenotypic analyses of single, double, and triple mutants confirmed functional redundancy. 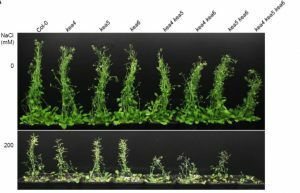 The triple mutant kea4 kea5 kea6 had small rosettes, short seedlings, and was sensitive to low K+ availability and to the high sodium conditions imposed by high salinity. The kea4 kea5 kea6 mutant plants also had a reduced luminal pH in the Golgi, TGN, PVC, and vacuole, in accordance with the K+/H+ exchange activity of KEA proteins. Thus, the evidence presented suggests that KEA4, KEA5 and KEA6 are endosomal antiporters that mediate the pH and ion homeostasis of endomembrane compartments.